As you might know this blog generally deals with 14th century, but today we will move out of focus a bit. Vikingage is not even considered being part of the medieval age in Sweden, but as the rest of the world considers it a part it will be covered now as we want to put some light on dogequipment from Uppland. In Uppland, Sweden, old-time religion lasted longer. This also means that norse burial traditions also lasted longer. The habit of gravegifts is a heathen one. Christians generally frowned on this and christian graves have very few gravefinds. The Uppsala area was a religious hotspot, where the rulers of old lived. Great powerful people lived here and the Vendel gravefield is famous for its previking gravefinds. We will look on two objects found in two different graves. 200 years separate them. They currently resides in Museum Gustavianum in Uppsala. A very old and venerable museum. If this collar and chain have been used for guard or hunting dogs we do not know. A chain is seldom used for hunting, so this points toward a guard dog. The collar on the other hand might well have been used for a hunting dog. 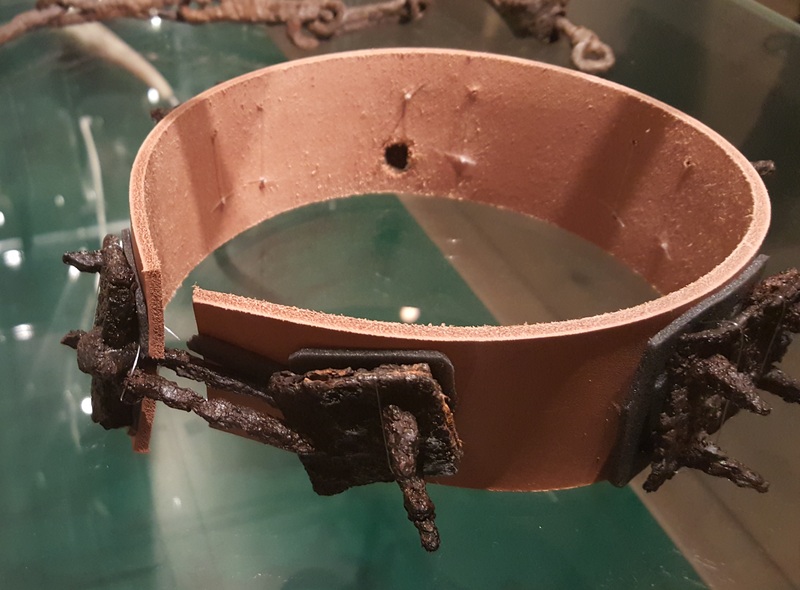 This dogcollar was found in a viking boatgrave.That makes it the belonging of a nobleman. We know from other graves that big sighthounds was used by norse nobles in this area (several have been found in graves in Old Uppsala), So called ‘Mjöhunde’ . The collar is dated to 10th Century (900 tal). The leather is obviously new, just to show how it would have been mounted. The collar have metal plates, approx 3 inches Square, with pointy spikes in each corner riveting it to the leather. We can see that the leather have been rather thick, able to hold a bigger dog. The grey pad between the metal and the new leather is just to protect the old rusty iron. It is hard to figure out how big the spikes might have been as they are all rusted down. But as spikes generally are used to protect a dog’s neck against predators getting their jaws around it, they probably have been bigger than their current stunted size. Two plates are connected with a metal link. My guess is that this has been the attachementpoint of a leash. This would possibly give the collar a semichoke character. This chain is thought to be a dogchain and it is a bit earlier then the collar. There is no easy way to open or close this for attachment. Probably it was used to attach a dog to something (a house perhaps? ) and having it guard it. 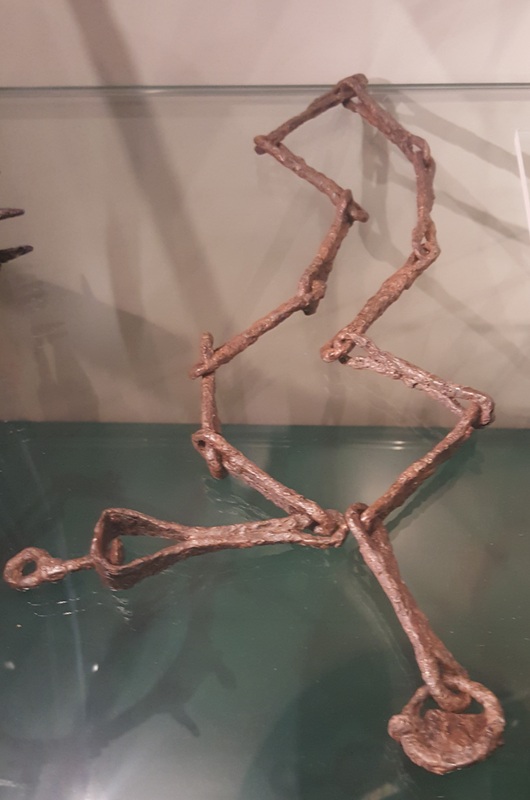 Or it was used with some kind of groundanchor, a short pole maybe. The chain is rather short, but dogkeeping could be quite harsh in old days. In all honesty I am just guessing about its use. There is a swivelpoint that is quite common later in dogequipment, but the other end terminates in a ring and a plate on it… I cant really see how this is helping holding that dog to anything… but there might have been more to it that have corroded away. The conclusion here is that we just wanted to show you a viking age collar as there is not that many out there and this one might be new to most.